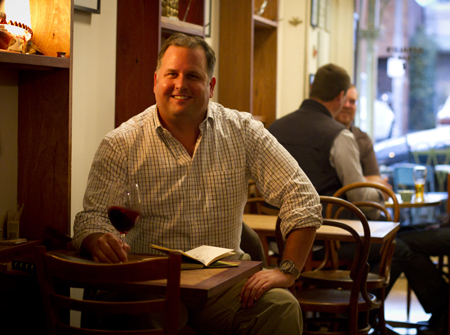 The road bringing Brash Higgins’ creator, Brad Hickey, to the rich terroir of his Omensetter Vineyard winds through two decades in virtually every aspect of food and wine across four continents. Brad completed his English Literature and Botany degree in Chicago in 1989, traveled to France to work in restaurants and vineyards, later made his way to Portland, Oregon to further expand his hands-on botanical interests by designing landscapes / brewing beer / baking bread, then eventually landed in New York City for ten years living the dream as a sommelier / wine director at world renowned restaurants such as Bouley and Danube. Inevitably, Brad broke with the hustle and bustle of the New York fine dining scene and hit the road to understand, from the ground up, the enigma behind the bottles which reach the table.